What’s the best way to send a message directly to the head of Starbucks Coffee stores when you want to get through with a complaint, a compliment, or an idea? Customers, investors, and employees of Starbucks very often have something they’d like to say about the company or their experiences in Starbucks stores. They want to know that their message—either positive or negative—has reached the chief executive officer without getting lost in corporate red tape. CEO Kevin Johnson makes that possible. Johnson took over the Starbucks reins from former CEO Howard Schultz in April 2017. He had served on Starbucks' board of directors since 2009, and he'd been in place as president and chief operating officer since March 2015. Howard Schultz is now the executive chairman of Starbucks. Johnson served on the board of directors of Juniper Networks before joining Starbucks. He has a bachelor's degree in business communications from New Mexico State University and a history of working in software development and business consulting. He spent 16 years with Microsoft. 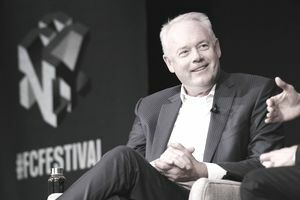 To date, he has thoroughly embraced Starbucks' goal of human connection with its customers and employees. Johnson finds time to give back to the community as well. He actively works with Catalyst, a nonprofit organization that assists women in business, as well as Youth Eastside Services, an organization providing youth and family counseling in Seattle. He says he is passionate about "the tens of millions of interactions, large and small, that happen between partners and customers every week." Yes, Starbucks considers its employees to be partners. You can send a message directly to Kevin Johnson using these e-mail, telephone, and physical mailing address. Starbucks is well known for both its high customer service standards and its exemplary social media engagement, so posting a message to Kevin on the Starbucks Twitter or Facebook accounts is likely to receive a response. It's easy to understand why "celebrity CEOs" would not want to communicate directly with the massive number of consumers who come in contact with their company every day. If a CEO spent his entire day dealing with individual customers who have complaints, commendations, suggestions, or questions, there would be no time left for things like leading the global operations of a multibillion-dollar corporation. Despite the obvious reasons why a world-famous CEO like Kevin Johnson wouldn't want direct public contact, there are a few reasons why he wants to be accessible, including customer demand for transparency and accessibility. Direct communication also discourages public broadcasting of issues that Starbucks would prefer to resolve quietly. Think about it: Are you likely to post your complaint or grievance on the Internet if the company's CEO is willing to hear you out and resolve the issue? Why not go straight to the top if the CEO leaves the door open?